Important Notice to our American customers. I am now very happy to announce that the book In Time With God has now been printed in the United States of America. An amazing lady at Chosen Engravings has volunteered to mail it out and distribute it in the United States of America. So please, dear American cousins, would you please make all your book purchases from her from now on. This saves us shipping books across the pond and I have agreed with her that she is to handle all the American sales from now on. It is also our aim to get the calendar printed for you to purchase, but in the meantime you can download the calendar for free from the downloads page of this website. To add this book to your order please ensure you select the appropriate shipping region so that postage can be calculated, then click the 'Add to Order' button. If you would like to purchase a copy by PayPal to send as a gift to friends or family at a different address from your own, would you please put your own address in the PayPal form and then, using the e-mail in the contacts page, give details of the address you would like your copy sent to. A version of this book will soon be made available for the Amazon Kindle. 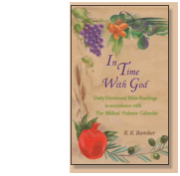 'In Time With God' is a 'page a day' daily devotional, which gives you a daily reading for each day of the Biblical Year, and gives a topic, Bible readings and a 'life application' for your spiritual growth, which is especially related to the actual day on the Biblical Calendar. The 'date' given at the head of each page is the date on the Biblical Calendar, for example, the '1st Day of the 1st Month' (Nisan) which falls in March or April. This date will fall on a different day on our January to December calendar each year. This is because the lunar calendar contains less days in a year, than the solar calendar. To keep the New Year at roughly the same time and season as the solar calendar, an extra month is added before the final month of the year in Leap Years. Leap Years occur seven out of every nineteen years. If this sounds complicated, don't worry. All you need do is download our free calendar, or purchase one from our website, (or someone else's website) and you can read the reading for the right day on the Biblical Calendar. It is fun to discover that some ordinary days in Gentile countries are actually very special days, even holidays, on God's Calendar, and of course they already are special days in the Land of Israel, since the Jewish people keep the Biblical Feasts. If you don't want to go to the trouble of reading the readings on the exact days they occur, you will still benefit from reading through the book, since it will give you an over-view of the Biblical Year and you will still be blessed by the truth that it reveals. You will see how perfectly the Old and New Testaments fit together, and how the calendar is indeed a shadow of 'things to come' (Colossians 2:16) and it reveals profound truth about our redemption and salvation through Yeshua (that's Hebrew for Jesus) which will change your life. You will find it useful to either download the current calendar from our download section or purchase the handy A5 printed version of the calendar. This will help you relate the dates in the book with today's date. You can buy both the book and the calendar together and save a little on postage. What a treasure R.K. Bamber's book "In Time With God" is. I expected to enjoy a daily bible reading book, but I've actually found it to be a book of daily bible study as well. The book is full of inspiration, and revelation, and I'm receiving immense pleasure from reading each daily portion. This work is clearly by inspiration directly from the Lord. From first picking up the book, you are aware that much prayer, thought, vision and understanding has been lovingly woven into each page. This is a delightful treasure to delve into and be blessed time and time again I have no hesitation in recommending this to you, and invest in an extra one for your friend!